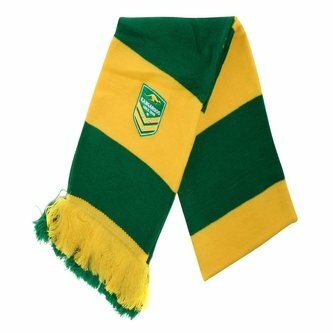 Theres no excuse to miss the game now when you wrap yourself up in this Australia Kangaroos Rugby League Supporters Scarf in Green and Yellow. Coming in a soft and comfortable 100% acrylic material, featuring the Kangaroos badge with green and yellow stripes for a standout look. Wear it and stay warm or wave it around and cheer on the team.